This movie encompasses the marvelous meaning of life. Friendship,laughter, caring for others and dedication to your art in life. Highly recommended. Good movie. Learned a lot about the history of these two. But not for anyone who (a) likes 3D, (b) likes James bond, mission impossible, or (c) is under the age of 50. Sat through some pretty bad movies lately, Vice, The Favorite and Mary Queen of Scots. This one makes up for them all. Don't miss if you're a Laurel and Hardy fan. The resemblance is uncanny as if you are watching the original duo. Very memorable. Great inside look at the final years of two exceptionally talented and funny actors, who were truly pioneers of classic American Cinema. Heartfelt and well acted. John C. Reilly usually makes me vomit because he is terribly unfunny, but in this he is absolutely perfect. Here's another fine mess you've gotten us into,,,,and I am so glad you did! A truly wonderful film ! "Not seen today often enough." That's because it's playing in so few theaters. A wonderful movie and great friendship. Not seen today often enough. The best movie this year. Going to see it again. May be cloudy and cold outside, this will warm your heart. Watch these to better appreciate the movie. Genius 1.County Hospital (1932) 2.Them Thar Hills (1934) 3.Men O' War (1929) 4.Our Wife (1931) 5.Brats (1930) 6.Be Big! (1931) 7.Any Old Port! (1932) 8.The Music Box (1932) 9.Dirty Work (1933) 10.Busy Bodies (1933) 11.Helpmates (1932) 12.Perfect Day (1929) 13.Blotto (1930) 14.Laughing Gravy (1931). Couldn't wait to see this film with my family. When difficulties arose, watching their films never failed to raise our spirits. Problem is you can't see it in Etobicoke. A powerfully sensitive portrayal of the two man comedy team, their wives, partnership, disappointments & mostly , their love for each other on their rise to success. About 20 years ago, my son was 19 & visiting. They had reruns of L & H & I thought he'd like it. The episode coincidentally was. "The Hospital"; the same in the movie. (but shorter version in the movie). He was busting at the seems with out loud laughter. Never forget it. 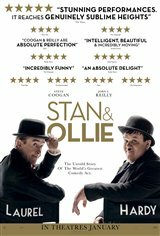 Loved this movie.............Steve Coogan and John C.Reilly did a great job as Laurel & Hardy and TWO THUMBS UP!!!!!!!!! !